To browse through the glossary, click on a letter in the alphabet below and you’ll see a page of words that start with that letter. Loss of tooth structure caused by a hard toothbrush, poor brushing technique or bruxism (grinding or clenching the teeth). A tooth or teeth that supports a fixed or removable bridge. Contemporary term for dental restorations that involve “bonding” of composite resin or porcelain fillings to natural teeth. Removal of tooth structure by blasting a tooth with air and abrasive. A most common filling material, also known as silver fillings, containing mercury (approximately 50%), silver, tin, copper and zinc. A state of pain relief or an agent that lessens pain. Partial or complete elimination of pain sensation. Numbing a tooth is an example of local anesthesia; general anesthesia produces partial or complete unconsciousness. The six upper or six lower front teeth. An acronym for Acute Necrotizing Ulcerative Gingivitis, commonly known as trench mouth or Vincent’s disease, which can be aggravated by stress and/or smoking. Surgical removal of the root tip to treat a dead tooth. Loss of structure due to natural wear. Cement placed under a dental restoration to insulate the pulp (nerve chamber). Juncture of two (three) roots in posterior teeth. Removal of a small piece of tissue for microscopic examination. Caries (decay) detection devices used during X-rays. Chemical or laser treatment of natural teeth for whitening effect. Anesthesia of a nerve trunk that covers a large area of the jaw. A mandibular block injection produces numbness of the lower jaw, teeth and half the tongue. Adhesive dental restoration technique. A tooth-colored composite resin to repair and/or change the color or shape of a tooth. Decrease in bone supporting the roots of teeth, which is a common result of periodontal (gum) disease. Devices used by orthodontists to gradually reposition teeth to a more favorable alignment. A stationary dental prosthesis (appliance) fixed to teeth adjacent to a space. It replaces one or more missing teeth, and is cemented or bonded, to supporting teeth or implants adjacent to the space. Bridges resemble natural teeth, and are designed to take the place of areas where there are gaps between teeth. Grinding or gnashing of the teeth, most commonly while the patient is asleep. Of or relating to the cheek. In dentistry, refers to the side of the tooth closest to the cheek. Chemical element needed for healthy teeth, bones and nerves. Hard residue, commonly known as tartar, that forms on teeth due to inadequate plaque control. Calculus teeth often are stained yellow or brown. One of the four pointed conical teeth located between the incisors and the premolars. There are two upper and two lower canine (cuspid) teeth. Mouth sore that appears whitish and often has a red halo. A canker sore usually has a 10-14 day duration. Common term for dental crown. Dental tool that uses high frequency ultrasonic waves to clean teeth. Soft tissue infection causing extensive hard swelling, a potentially dangerous condition requiring immediate attention. Hard tissue that covers the roots of teeth. A CEREC (Chairside Economical Restoration of Esthetic Ceramics, or CEramic REConstruction) crown is a ceramic dental restoration product. With CEREC, a crown can be made and fitted in a single appointment. There is less time involved, no impression to be made and sent to lab, no waiting and no additional visit to have the crown placed. Your dentist uses 3D imaging technology to photograph the tooth. Next, he uses CAD/CAM technology to design the crown. The 3D design is then transmitted to a milling machine that carves the crown out of ceramic block. The whole procedure takes between 1-3 hours. Log of dental or medical records. Device that retains a removable partial denture to stationary teeth. The removal of dental plaque from teeth with the intention of preventing cavities (dental caries), gingivitis, and periodontal disease. There are several different types of “cleanings” that are recommended by the dentist and hygienist depending on the patient’s oral health. Services may include removal of plaque and tartar, stain removal, fluoride application, sealants (for children), teeth polishing teeth, including fillings and crowns, cleaning and adjustment of dentures and partial dentures. Material composed of plastic with small glass or ceramic particles that is usually cured with filtered light or chemical catalyst. Refers to a variety of dental treatments aimed at improving the appearance of the teeth. Cosmetic procedures range from bleaching, crowns, veneers or bonding can help correct minor/major flaws and gaps to improve appearance and smile. Artificial procedures employed by a rescuer after cessation of breathing or heart stoppage. A condition where one or more teeth of one arch to the opposing tooth or teeth of the other arch, caused by deviation of tooth position or abnormal jaw position. A unilateral posterior crossbite is what occurs when your upper teeth fall inside your lower teeth on one side when you bite down. An anterior crossbite, which is similar to an underbite, is what occurs when your top front teeth fall behind your lower front teeth when you bite down. A type of dental restoration which completely caps or encircles a tooth or dental implant. Crowns are often used to repair and strengthen damaged teeth or to improve the appearance of teeth. Dental crowns are permanently cemented into place. The tooth-crown combination that results is cared for and functions like any natural tooth. Removal of diseased tissue from a periodontal pocket. A tooth having one point. One of the four pointed conical teeth (two in each jaw) located between the incisors and the premolars. Commonly called “eye teeth”. A soft or hard tissue sac filled with fluid. Doctor of Dental Surgery, equivalent to D.M.D. Doctor of Medical Dentistry, equivalent to D.D.S. Destruction of tooth structure caused by toxins produced by bacteria. Also called dental cavities or dental caries. Commonly called “baby teeth,” the first set of teeth. Consists mainly of a checkup and cleaning but may vary depending on your individual dental needs. Your dentist will look for developing tooth decay, gum disease or other oral health problems, as well as check your face, neck and mouth for abnormalities. An artificial tooth that is anchored in the gums or jawbone to replace a missing tooth. Dental implants look like natural teeth and are normally made of titanium at the root. The implant process takes about six months overall. The tooth/teeth must be created to fit the individual, implanted into the mouth and anchored to the jawbone. Then, a permanent crown is put on the implant and it looks like a normal tooth. A removable (partial or complete) set of artificial teeth. The production of dentures dispensed directly by laboratory technicians. Refers to the surface of a tooth towards the back of the mouth or that is farthest from the middle of the front of the jaw. Hard tissue covering the portion of tooth above the gum line. The first layer of tooth that is visible in the mouth. A specialist who treats injuries, diseases and infections of the tooth pulp (nerve chamber). You would go to an endodontist for a root canal. The study of the incidence of disease in a population. The process of teeth protruding through the gums. The process of shedding deciduous (baby) teeth. The branch of dentistry concerned with the extraction or removal of teeth. A sharp, pointed probe used on tooth surfaces to detect caries or other defects on the surface of teeth. Tooth colored overlay on the visible portion of a crown that is made of acrylic, composite or porcelain. Fellowship Academy of General Dentistry. The channel that emanates pus from an infection site in the gum. The lifting of gum tissue to expose and clean underlying tooth and bone structures. An instrument used for removal of teeth. The practice of gathering legal evidence for body identification or judicial issues. The valley found on the surface of posterior teeth. The distance between the upper and lower teeth with the lower jaw in rest position. A removable dental prosthesis (appliance) that replaces all upper or lower teeth. Extensive restorations of natural teeth with crowns and/or fixed bridges to manage bite problems. Controlled state of unconsciousness, accompanied by a partial or complete loss of pain sensation, protective reflexes, and the ability to respond purposefully to physical stimulation or verbal command. Benign changes in the usual color and texture of tongue that does not require treatment. The inflammation of gum tissue. A new technique for replacing bone tissue. A small boil or abscess on the gum, often resulting from tooth decay. The exposure of dental roots due to shrinkage of the gums as a result of abrasion, periodontal disease or surgery. A techinque employed by a rescuer due to the obstruction of victim’s airway. The swelling of effused blood beneath tissue surface. A bruise. Health or Dental Maintenance Organization, which specifies a health or dental care provider that a patient may see. A disinfecting solution used in dental irrigation procedures or as a mouth rinse. A person trained and licensed to provide preventive dental services, such as cleaning the teeth and taking x-rays, usually in conjunction with a dentist. Increased blood flow that may cause dental sensitivity to temperature and sweets. May precede an abscess. A partial or completely unexposed tooth that is wedged against another tooth, bone, or soft tissue, precluding the eruption process. An artificial device that replaces the tooth root and may anchor an artificial tooth, bridge or denture. A mold made of the teeth and soft tissues. The surgical incision of an abscess to drain suppuration (pus). The four upper and lower front teeth, excluding the cuspids (canine teeth). A local anesthetic procedure effective for upper teeth and soft tissue or the placement of anesthetic under the gum, allowing it to seep into bone. An indirect filling made by a dental laboratory that is cemented or bonded into place; or a direct placement of dental composite resin restoration at chair side. The space between upper and lower teeth. The surfaces of adjoining teeth. A small video camera used to view and magnify oral conditions from which images may be printed. Invisalign aligners are clear, removable teeth aligners used as an alternative to traditional metal braces to straighten teeth. A crown for a front tooth, usually made of porcelain. Medications placed in gum pockets to reduce infection and inflammation. A thin plastic or porcelain veneer produced in a dental laboratory and then bonded to a tooth. Nitrous oxide, an odorless inhalation agent that produces relative analgesic (sedation), and reduces anxiety and creates a state of relaxation. Injury of bodily tissue due to infection, trauma or neoplasm. Refers to the surface of a tooth closest to the tongue. Partial or complete elimination of pain sensation in the immediate vicinity of its application or injection. A “bad bite” or misalignment of the upper and lower teeth. A program whereby patient-dentist assignment and dentist reimbursement is administered by a separate, external organization. Refers to the surface of a tooth towards the front of the mouth or that is closest from the middle of the front of the jaw. Refers to the chewing or grinding surface of the bicuspid or molar teeth. A laboratory-produced restoration covering one or more cusps of a tooth. A dental specialist who manages the diagnosis and surgical treatment of diseases, injuries and deformities of the mouth and supporting structures. Requires four additional years of training after dental school. The process of maintaining cleanliness of the teeth and related structures. A dentist specializing in the study of oral diseases. The branch of dentistry dealing with the prevention and correction of irregular teeth, as by means of braces. Dental braces are metal or metallic braces made from an alloy that hold teeth in a certain position and then are gradually adjusted to straighten crooked teeth, close gaps between teeth, or push teeth apart in some cases. Invisible braces are tools used to straighten teeth (minor repairs), Tools such as plates, retainers, and similar dental appliances aid in these efforts, and some are worn after the braces are removed permanently. Refers to a lower jaw being too far behind the upper jaw or a misalignment of the teeth. A denture that fits over residual roots or dental implants. When the upper teeth are very forwardly placed, commonly called “buck teeth”. A partial loss of sensation that is temporary or permanent. A removable dental prosthesis (appliance) that replaces one or more natural teeth. The field of medicine that deals with dentists for children. A children’s dentist specializes in the care of a child’s small mouth and teeth, including braces, crowns, fillings, cleanings, plates, and x-rays. Specializes in the needs of children including calming fears, specialized equipment and education about good oral health. A cleaning procedure meant to remove contamination and infection from beneath the gum. Scaling removes deposits of bacterial plaque, calculus, food debris, and pus that have accumulated in the infected pocket due to periodontitis. Root planing removes any infected tooth structure, smooths and cleans the root of the tooth so that gum tissue may heal. A record measuring the depth of gum pockets around the teeth. The recontouring or aesthetic management of diseased gum and supporting tissue. A dental specialist who treats the gums and supporting soft and hard tissues in order to retain natural teeth and prepare for surgical placement of dental implants. Heredity, diet and other factors can result in gum disease. The second set of teeth, also know as “adult teeth”. There are thirty-two permanent teeth, consisting of six maxillary and six mandibular molars, four maxillary and four mandibular premolars, two maxillary and two mandibular canines, four maxillary and four mandibular incisors. A small defect in the tooth enamel, or the junction of four formative lobes of a developing tooth. A soft, sticky substance that accumulates on teeth and is composed of bacteria and food debris. Since plaque is constantly growing in your mouth, the best way to remove it and to prevent tartar build-up is to brush and floss your teeth every day. A replacement tooth mounted on a fixed or removal appliance. An all-porcelain restoration that covers the coronal portion of tooth (above the gum line). A restoration containing metal coping for strength covered by porcelain for appearance. A tooth-colored restoration made of porcelain and cemented or bonded in place. A thin layer of porcelain, fabricated by a laboratory and bonded to a natural tooth to replace lost tooth structure, close spaces, straighten teeth, or change color and/or shape. A thin metal rod inserted into the root of a tooth after root canal therapy. A post provides retention for a “coping” which replaces lost tooth structure and retains crowns. A post and buildup to replace lost tooth structure and retain crowns. A single structure that combines post-core and crown. A preferred provider or dental organization, which a health care dental provider may join offering fee for service treatments at reduced fees. A prosthodontist specializes in replacing parts of the mouth, jaw, or teeth, often using an artificial device such as dentures, partial dentures, and other items to improve the appearance and correct common oral problems. “Prosthodontics” involves dentures, bridges, crowns, implants, and similar areas of expertise commonly associated with cosmetic dentistry. Many dentists who specialize in prosthodontics also go on to receive special training in oral or maxillofacial surgery or prosthodontics. This allows them to fix or repair other missing facial features such as nose, eyes, and/or ears, to name a few. Complete removal of the pulp (commonly done in children’s teeth). Inflammation of the pulp, which is common cause of toothache. Partial removal of the pulp tissue. Older term for periodontal (gum) disease. The insertion and temporary fixation of partially or completely avulsed teeth resulting from traumatic injury. The acrylic restoration of a denture base to compensate for bone loss. Direct in conjunction with a dental laboratory. The replacement of a portion of a damaged tooth. The partial root structure remaining in the jaw after extraction or fracture of a natural tooth. The tooth structure that connects the tooth to the jaw. A dental procedure to save a tooth by removing the diseased or injured tissue in its root. The treatment for disease of the dental pulp in which the pulp is removed and replaced by filling material. The removal of a portion of diseased root structure, but retaining the remaining natural tooth. A soft latex sheet used to isolate one or more teeth from contamination by oral fluids and to keep materials from falling to the back of the throat. A clear lubricating fluid in the mouth containing water, enzymes, bacteria, mucus, viruses, blood cells and undigested food particles. A suction tube placed in the mouth to remove saliva. The glands located under the tongue and in cheeks that produce saliva. Thin resin material bonded in the pits and fissures of back teeth for the prevention of decay. Reparative tooth structure produced by the pulp in response to tooth irritation. Inflammation of the sinus that may mimic dental pain. A dental device that holds the space lost through premature loss of baby teeth. The connection of two or more teeth so that they function as a stronger single structure. A common term for dental calculus, a hard deposit that adheres to teeth and produces a rough surface that attracts plaque. An insurance company, union or government agency that pays all or a part of cost of dental treatment. Temperomandibular disorder, the term given to the condition characterized by facial pain and restricted ability to open or move the jaw. The temporomandibular joint where the lower jaw attaches to the skull. The early embryonic structure that becomes a tooth. An ointment that produces mild anesthesia when applied to the tissue surface. Common bony protuberance on the palate or lower jaw. The process of placing a natural tooth in the empty socket of another tooth. Injury caused by external forces, chemical or temperature extremes, or poor tooth alignment. Usual, Customary and Reasonable fees. A plastic or porcelain facing bonded directly to a tooth to improve its appearance. The arbitrary space between the upper and lower jaws upon closure that may decrease over time due to wear, shifting or damage to the teeth. The third (last) molars that usually erupt between the age of 18-25. Dry mouth or decrease in the production of saliva. 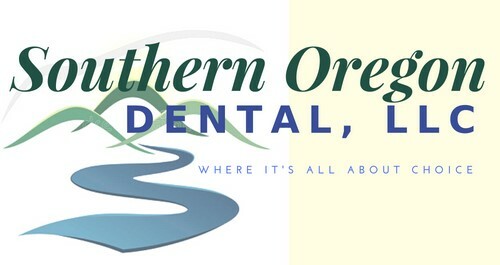 © 2019 Southern Oregon Dental. All Rights Reserved.